Over Christmas a pal on Facebook posted a video of Boogie Nights by Heatwave. With it’s super-slinky bass sound and below-the-bell-bottoms baritone “got to keep on dancin’, keep on dancin‘” backing vocal, it’s the sort of record that could have me Dad dancing for ages. (*Just to clarify – I’m not a Yorkshire man. I’m from further oop north than that – when I say me Dad dancing, I don’t mean it could get my own father on his feet. Although it probably could. I mean that Boogie Nights makes me dance in my own rhythmically-challenged Ayrshireman fashion. Like I said – just to clarify). 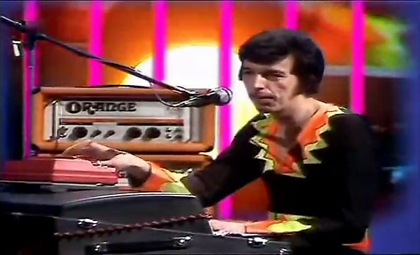 Rod Temperton, the man who re-invented slick dance floor disco and wrote just about the most recognisable track of the 80s and beyond is a skinny-arsed, geeky white man with a rubbish pencil moustache and pre-perm footballer’s haircut. All the way from Cleethorpes in the north of England. A town with about as much musical pedigree as a squeaky dog toy. Yet there he is – the not-quite-invisible man to the side, goofing and gurning his way through three minutes of proper 70s American black man funk. And he wrote it. On top of a pile of dirty washing in a tiny flat. No wonder he’s laughing. All the way to the bank, he’s laughing. Rod’s story is perfect Plain Or Pan fodder. Here follows a brief catch-up if you’re new to his name. Beginning his musical apprenticeship in the working mens’ clubs around Tyneside and the north east of England, by the early 70s Rod had left the glamour of the frozen food factory where he worked in Grimsby and sought out his chance on the German club circuit. Like most bands who did this tour, he played long-into-the-night sets and his playing improved ten-fold. Rod and his Hammond organ were much in demand. An ad in Melody Maker led to him joining Heatwave and it was from there that Rod’s talents took him to the toppermost of the poppermost. Not quite the token honky (Heatwave’s drummer looked out of place also), Rod was the driving force behind the multi-cultural group’s success – Stateside million sellers, the whole shebang, before his work brought him to the attention of Quincy Jones. He’d go on to write three tracks for Michael Jackson’s debut Off The Wall LP and was retained by Jones and Jackson to work on the difficult-second-album follow-up, Thriller. Quick! Grab these! They’ll probably be gone faster than you can say Beat It!